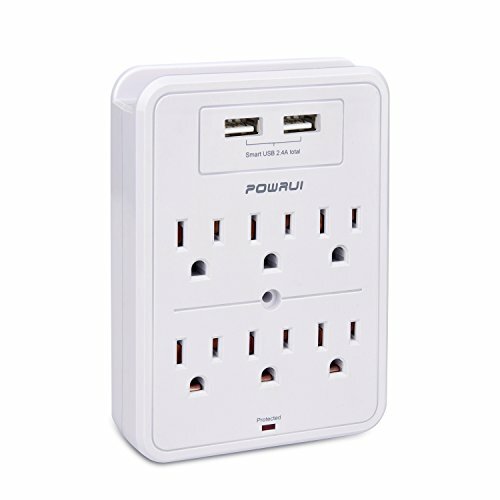 •For the devices with a rated input current 1A such as smart phones, iPods, Kindle, etc., you can charge quickly in 5 ports at the same time. •For the devices with a rated input current 2.4A such as iPad and other tablets, you can charge 2 of them max and 3 of 1A devices at the same time to keep a fast charging speed. •The built-in smart chip can identify your devices and distribute the correct current to each port, even the 2.4A max output will not damage the rated 1A devices. 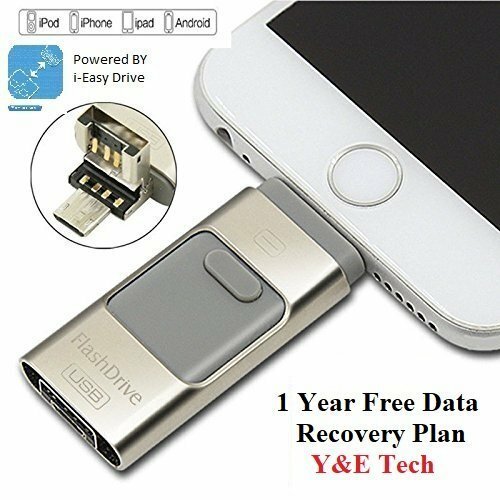 •For iPhone, iPod, Kindle, Bluetooth, headsets etc. 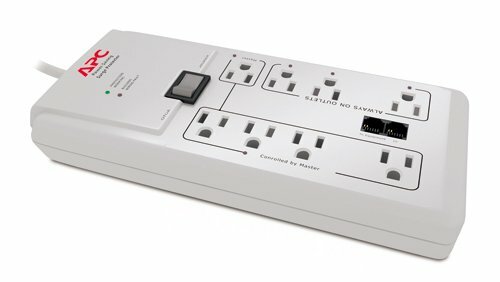 whose rated input current is 1A only,you can charge 5 ports at the same time. •For iPad and other tablets whose rated input current is over 2A, you can not charge 3 ports or more at the same time,otherwise the charging efficiency would be much lower. •Please remember to turn on the button on the bottom of the Power Strip Tower when you intend to you use the USB ports. The button control the power of the usb ports which can protect the Power strip well. 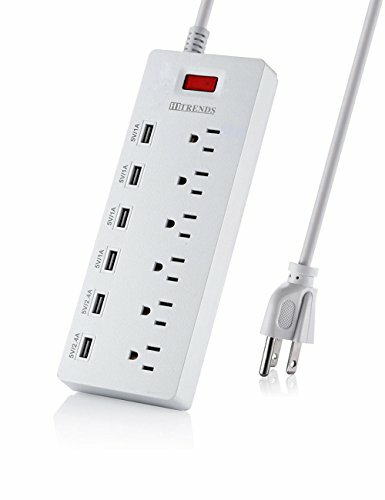 USB HIGH-SPEED Power Strip Tower : Max Single USB output is 2.4A that can give your devices full speed charge, and 16-outlet surge protector intelligent USB ports(total USB output:5A) can charge at the same time cellphone, ipad, MP3,digital camera,tablet etc with an adjustable current without damaging your devices. FIRE-RETARDANT & MULTI-PROTECTION: CE, FCC & RoHS Certificates. No potential safety hazard. This USB power strip has lightning protection, surge protection, overload protection, and fireproof function (No naked flame). It will automatically cut power to protect connected devices when voltage surge or over-current is detected. Please be assured to use our power strip. 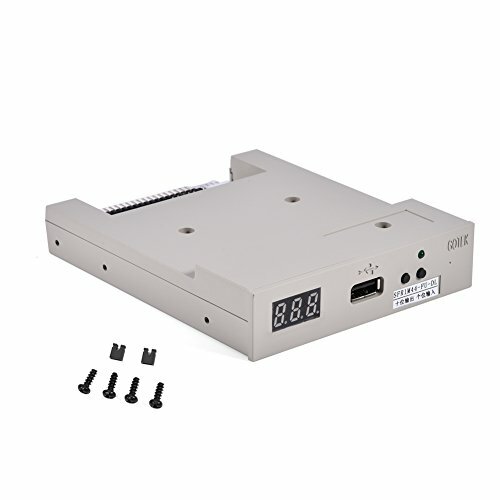 STRONG COMPATIBILITY: Rated Voltage is 95V-250V and Rated current is 15A. 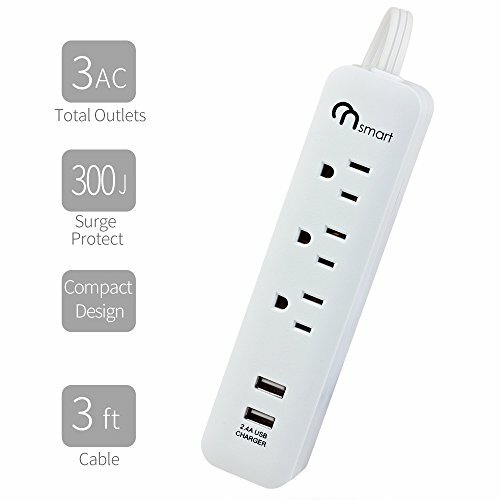 That means, you can use this power strip tower to charge iPhone, iPad, computers and other home or office appliances at the same time! (Max wattage is up to 1800W if under 200V above, and max wattage would be 1875W if under 125V.) 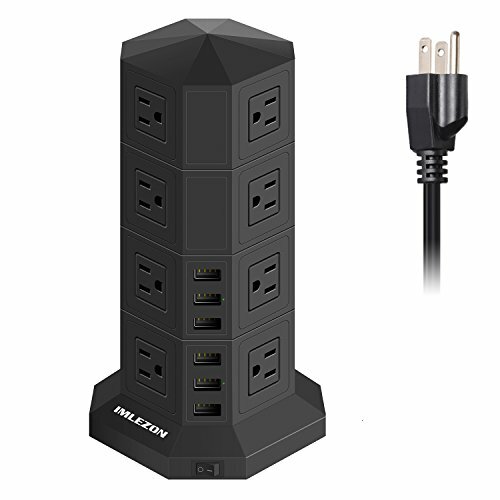 Buying one IMLEZON power strip tower is cost-effective and more convenient than two traditional power strips. Why still hesitate? Order today and soon you will see that your choice is right! SPECIAL DESIGNS: First, Outlets and ports of IMLEZON power strip tower are distributed vertically at four sides, saving space and providing enough space between each outlet and convenient to use. 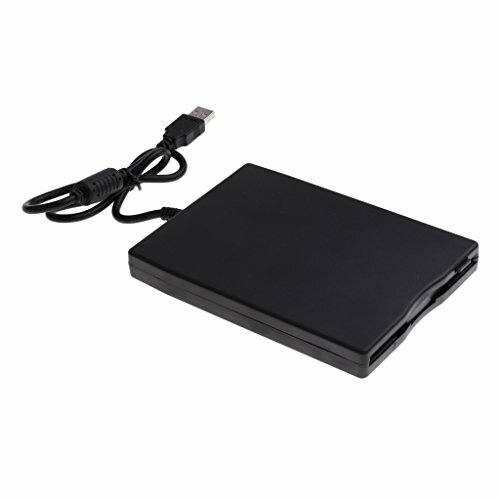 Second, overload protector can cut off the power to safeguard connected devices. Third, each layer has an ON/OFF switch that can save energy. Four, indicator light tells you the tower works or not. Fifth, the main switch of USB ports at the bottom gives you an easy control. Sixth, cord is 9.8ft long. SATISFACTION GUARANTEE:100% satisfaction guaranteed. 90 days changing or refunding without reasons.24 hours Mon-Fri customer service can supply better customer service to you.